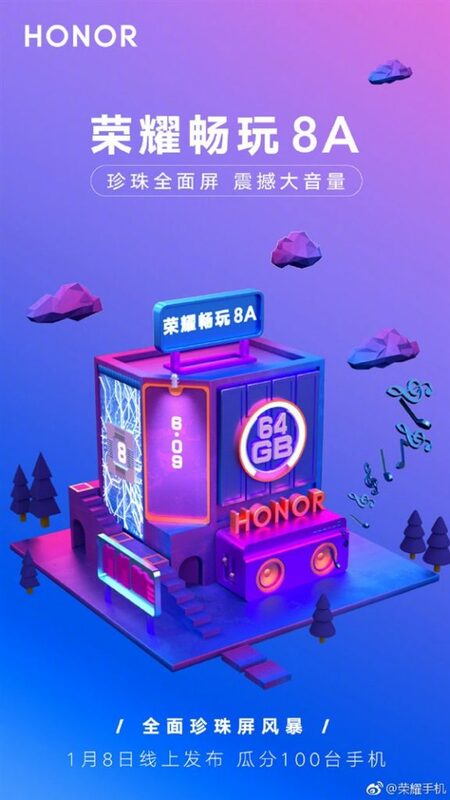 Honor 8A to Launch on January 8 - Playfuldroid! The above teaser has no information on the specifications of the smartphone. However, through the TENAA listing it has been revealed that the handset will be equipped with a waterdrop notch screen. The company is referring to it as pearl screen in the Weibo post for the above teaser. The Honor 8A will be featuring a 6.088-inch IPS LCD display that will carry support for HD+ resolution. The smartphone is fueled by 2.3 GHz octa-core processor and 3 GB of RAM. Its storage variants are 32 GB and 64 GB. For photography, the Honor 8A has a rear camera of 13-megapixel and a front-facing camera of 8-mgeapixel. The smartphone is preloaded with Android 9 Pie OS. Probably, there could be a Pro variant for the smartphone featuring a fingerprint reader and rear-mounted dual camera setup. The Honor 8A will be arriving as the successor of the Honor 7A that was unveiled in April 2018.